I thought I'd do something novel this week and post something I actually finished!! Yay! My pincushion is finished and ready to mail today! One of the best bits of easter for me is all that time to finish things off. Orders complete, tweed pants in the mail and a pincushion! This one was really fun to make. I used familiar old bits of tweed and shirting and recycled kimono fabric for the back and attached one of my felt lovebirds. Later today I'll be tackling some PJ's for Seeeorwardah (code name for my Sis's partner in crime, long story). I hope he loves them. I've heard stories of bottomless PJs... that he still wears!! 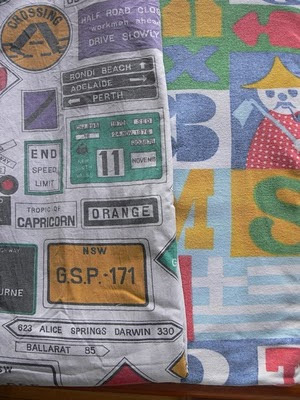 I'm hoping to whip up something suitable using these vintage sheets. Don't old sheets just make the best PJs? They are always soft and lived in from the start. See where, what and how others are creating over at Kirsty's. Your pincushion is very sweet. Some lucky swappee is going to be very happy indeed! 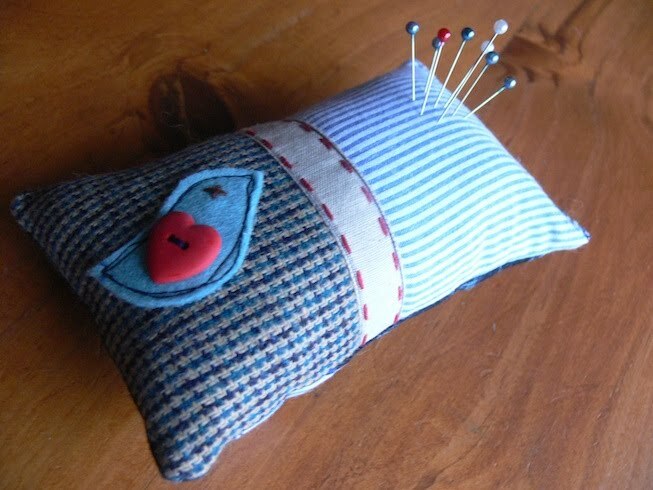 I love your pincushion. So wish I had known about this swap in time! The pincushion is so lovely!!! Your pincushion is fabulous & I really like the street sign fabric. Oh, be mine be mine pincushion of my heart! It's adorable Lauren. Where did that signage sheet come from? It's fabulous. The Little One has the very same sheets (on the right) on her bed, which were once her Daddy-o's. Those sheets are great. I LOVE old sheets for PJs. There is nothing quite like them for softness. The little bird on your pincushion is gorgeous! DARLING pincushion! That would have been an awesome swap to join in on and whoever is getting the one you made is so lucky! The pincushion is goregous. Hope the pjs are a hit! LOVE your pincushion, the bird is very sweet! love the pincushin lauren, and really cant wait to see these pj's...great fabric. oh what lovely sheets. i also love that lived feel when you make something out of vintage sheets. how lucky he is! i can't wait to see who your pincushion is for ... someone is going to be so happy. i got mine this week and it's been such a wonderful experience. thanks to kate for organising it. we didn't make it to ballet yesterday, as I was sick with the flu. We hope to be there next week and I'll remember to bring the black ballet skirt. Thank you! It has arrived and it is very, very gorgeous. If I saw it at a market or in a shop, I would just have to buy it. I love the fabrics and the little bird is perfect. Thanks for making my day.